I hope you have all had a good Easter holiday! The kids are back at school and for me this means getting back into our routines. Applying my 3 simple ways to get back on track post-holiday, it makes life so much easier. There is so much more I could do, but by keeping it simple it means that it’s doable, enjoyable and taking baby steps is so much more effective that trying to do too much at the same time. Our healthy eating habits and our exercise routine takes a real downward turn during a holiday. Different environments, not cooking all of our meals myself and a pudding here and there means that we have consumed lots of yummy food, but it was definitely not the healthiest of all. Rather than worrying about it, I go back to my 3 simple ways to get back on track post-holiday and I start ADDING the fresh, whole and healthy foods I really crave by now. If you have read my tips about weaning your kids (and yourselves) off sugar after the holidays then you know what I mean. Let’s face it. The children are still going to ask me for the sweet stuff. Even more so after the chocolate overload I would say. And instead of saying NO, I will say yes but I will offer them some yummy refined-sugar free snacks instead. However, it doesn’t mean that these can be consumed without limits. Let’s remember, if it tastes sweet it is sweet and we will have less of it. Simple. 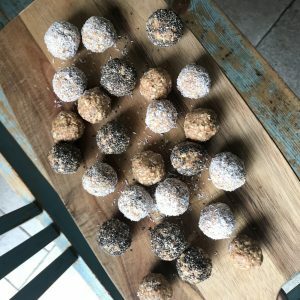 I make two lots of energy balls and keep them in the fridge all week. Why not try one of them yourself? For my peanut butter energy balls you don’t even need a blender. A mixing bowl is all you need. Bring all ingredients together, combining really well. Roll into small balls, about 2cm diameter. Then roll each ball in either desiccated coconut or chia seeds. Refrigerated for 1 hour before eating. 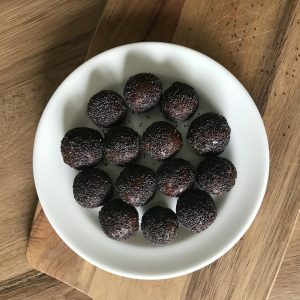 The Tahini truffles are so chocolaty that you will instantly feel satisfied. With 3 ingredients only they are super simple to make and are a no-brainer towards 3 simple ways to get back on track post-holiday. Blend first 3 ingredients in a food processor, cover and chill in the fridge for 1 hour. Roll into small balls and place in a small bag with the sesame seeds to coat. 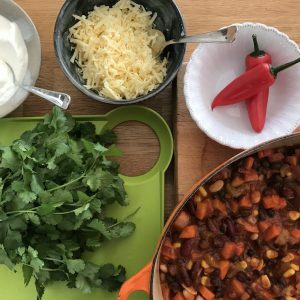 For my family friendly veggie chilli recipe read on here. This is one of my most versatile recipes and it ticks all the boxes. It’s easy to make (all ingredients go into one pot). Make more: (I keep portions in the freezer for that go-to meal in between). A super versatile reciupe- sometimes I serve it with brown rice or quinoa, other days with flatbreads. I add fresh chilli for the adults and keep it mild for the kids. Add guacamole, yoghurt and fresh parsley and you will have a fabulous spread for when you are entertaining too. I hope you find my 3 simple ways to get back on track super helpful and remember, one step at. time towards a healthy and happy family life!